The award-winning 2015 Nissan Murano has impressed the world with its attractive exterior, superior handling, and astonishing technological features. This crossover SUV has been completely redesigned to better suit every aspect of your life. The 2015 Murano’s outstanding spacious, comfortable interior, advanced technological features and amazing safety elements, this SUV has all of the characteristics to make you fall in love with your next new vehicle. Blur the lines of luxury with the affordably priced, 2015 Nissan Murano. The new Murano is powered by a 3.5L V6 engine that also achieves impressive fuel efficiency and generates 240 horsepower and 240 lb-ft of torque. The efficient engine, along with the sculpted, aerodynamic exterior design, lets you reach 28 mpg while cruising long stretches of highway and 21 mpg while exploring the city*. Fuel economy like this is comparable to some sporty sedans out there, but with the 2015 Murano you will be getting much more cargo room and seating flexibility. The 2015 Murano stunning, bold design has heads turning across the globe. Some of our favorite standard exterior features on the 2015 Nissan JUKE include: 18-inch machine-finished split 5-spoke aluminum-alloy wheels, LED Daytime Running Lights, automatic on/off headlights, LED taillights, chrome door handles, power outside mirrors with LED turn signal indicators, UV-reducing solar glass, rear privacy glass. On higher trims, you can find more impressive features including: fog lights, convenient roof rails, and sleek LED headlights. From quick, to-and-from city commutes, to long cross-country road trips, the 2015 Nissan Murano is ready for whatever the road may throw at it. The exterior of the 2015 Nissan Murano is all about comfort, with impressive attention focused on the rear passenger seats. Some standard interior features include: Advanced Drive-Assist® Display with 7-inch WVGA color display, NissanConnect? with Mobile Apps, hands-free text messaging assistant, Bluetooth® Hands-free Phone System, RearView monitor, Fine Vision electroluminescent gauges, Dual Zone Automatic Temperature Control (ATC) with in-cabin microfilter, rear passenger air conditioning vents, steering wheel-mounted cruise controls, Nissan Intelligent Key® with push button ignition, variable intermittent windshield wipers, cloth seat trim, and Jasper Pearlescent or Brushed Silver trim. Make sure you and everyone else stays entertained with amazing features like the AM/FM/CD audio system with 6 speakers, MP3/WMA CD playback capability, auxiliary audio input jacks, front USB connection port for iPod® interface and other compatible devices, SiriusXM Satellite Radio with 3-month trial subscription, streaming audio via Bluetooth® wireless technology, illuminated steering wheel-mounted audio controls. Looking for even more? Not a problem! Some higher trim level features include: NissanConnect? with Navigation and Mobile Apps with 8-inch color touchscreen monitor and voice recognition for audio and navigation, SiriusXM® Traffic and Travel Link®, Remote Engine Start System with Intelligent Climate Control, Around View® monitor, HomeLink® Universal Transceiver, heated leather seats, and a Bose® premium audio system with AM/FM/CD and 11 speakers including dual subwoofers. 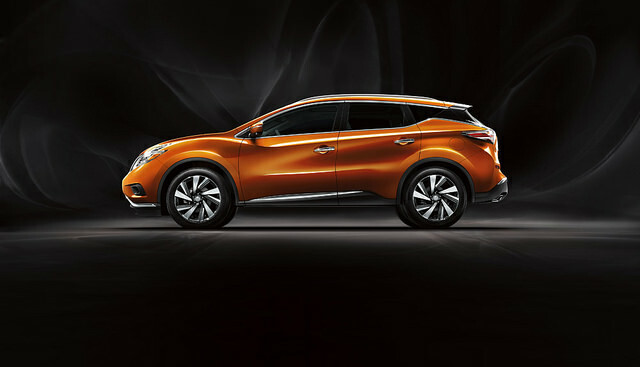 The Murano keeps getting better and better. Be sure to stop into Carriage Nissan and take the 2015 Nissan Murano for a test drive today! With our large inventory, our team here at Carriage Nissan loves helping our customers find the perfect new car or used car for them! Please feel free to contact us if you have any questions or would like to schedule a test drive!